Although they may at times seem like an unlikely pairing, the Chinese Ox and Sheep compatibility can find success in a relationship provided they are able to see their respective differences as strengths. The strong, conservative nature of the Ox will be in sharp contrast to the dreamy, artistic attitudes of the Goat. One overwhelming positive for this pair is that the male Ox plays nicely into the role of caretaker. This is strongly desired by the Goat – especially the female Sheep. Likewise the emotionally intelligent Goat male will provide a committed and secure element to the relationship for the Ox female. They also share a love of home and family. This commonality may be the rock upon which the two can build. It may take a lot of patience from the Sheep and Ox soulmates to understand each other, but patience is the key to any relationship. The Sheep and Ox couple will be happy to stay at home cuddling in front of the fire as neither has a strong desire for the limelight or social scene. Both will enjoy a comfortable home. However, they will dramatically differ in what that means based on the differences in their personalities. There will never be a lack of love in the Sheep-Ox relationship, even if it is not overly exciting. They will find happiness in the solid, secure sense of family and belonging making this a stable pair. But they will have work through their differences with grace and understanding. When the Goat is dating the Ox, they will be more friends than lovers. The Chinese Ox zodiac sign prefers practical comforts. They value hard work and simplistic trappings. It may be hard for them to understand why luxury is important to their lover, even to the point of seeing them as irrational or wasteful. They are honest and straightforward and not likely to sugar coat facts. The Sheep man or woman may be partial to comforts that lend artistic and aesthetic appeal. They are fond of eccentric and comfortable indulgences. This can create a rift between them as the sensitive Goat may find the Ox’s criticism hurtful, even confining. They are also not one to appreciate feeling controlled. Therefore, furthering the potential for hurt. The shy and socially awkward Ox man or woman may have a difficult time with the Sheep’s need for emotional and romantic indulgences. They may find them even uncomfortable and embarrassing. The Goat’s ‘mothering’ or doting may be taken as domineering which is unlikely to be met with favor and even seen as nagging. This could spoil the Sheep-Ox compatibility and lead to a breakup. The stubborn Ox also may not appreciate their lover’s need for perfection. They will likely become frustrated with their partner for spending unwarranted amounts of time getting just the right combination of colors, accents and accessories together. Likewise the Goat may be frustrated at their partner’s unwillingness to see the whole picture, finding their minimalistic nature boring. The Sheep and Ox marriage in general is likely to be financially stable and provide a comfortable living for the two, forecasts Chinese astrology compatibility. As long as they can work together to balance their spending, this will be a good match for the Goat who likes to indulge. The trick will be for both to find a balance in having fun as well as being practical. They will find it easy to agree when it comes to spending on good food and drink! Even in bed, the goat and ox couple will sexually complement each other. 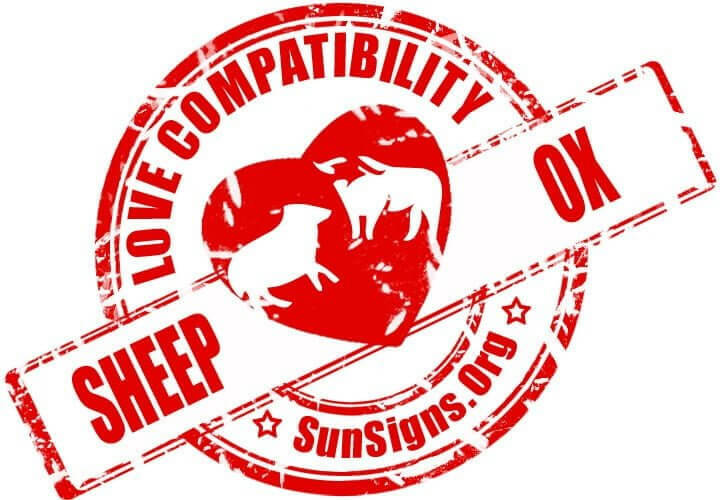 Sheep & Ox Chinese Horoscope Compatibility Rated 2 Hearts!